Click here to contact one of our offices, we can arrange for one of our professional, experienced valuers to come out at a time and date that suits you. The property valuation will give you an indication of what you can expect to get for your property if it goes on the market. Why choose us? Apart from offering excellent customer services, all our agents are trained to help sell your property and all have multiple years of experience within the industry with great local knowledge. We pride ourselves on our ability to offer the best property selling experience. We have multiple marketing strategies including detailed property brochures, access to all the major property portals, and much more. Remember we are ‘The Property People’ to choose. Take on is where one of our professional team will come out and take photo’s, further details and room measurements to ensure you property is correctly and efficiently advertised. To prepare for this, ensure your house is clean and tidy, dishes washed, clothes taken off the back of doors and de clutter. This is also helping you to prepare for viewings and will show your property off to the best possible standard. It is a legal requirement that all properties (subject to some exemptions) have at least organised for a valid EPC to be available before it can be marketed. If an EPC is not provided within 28 days all marketing must cease! EPC are valid for 10 years. We constantly are looking for new ways to push and advertise your property, give us a call to discuss the range of marketing initiatives we can offer. Your property is now on the market and ready for viewings. BJP staff are more than happy to do accompanied viewings for you which can be really useful if you have any commitments elsewhere. Please ensure you let us know about any interesting facts relating to your property as will defiantly help us sell it. We will deal with all offers that come forward on your property, and put them forward to you over the phone and in writing. We will advise you in the best possible way and ensure you get maximum value for your property. Congratulations, you have nearly sold your property. 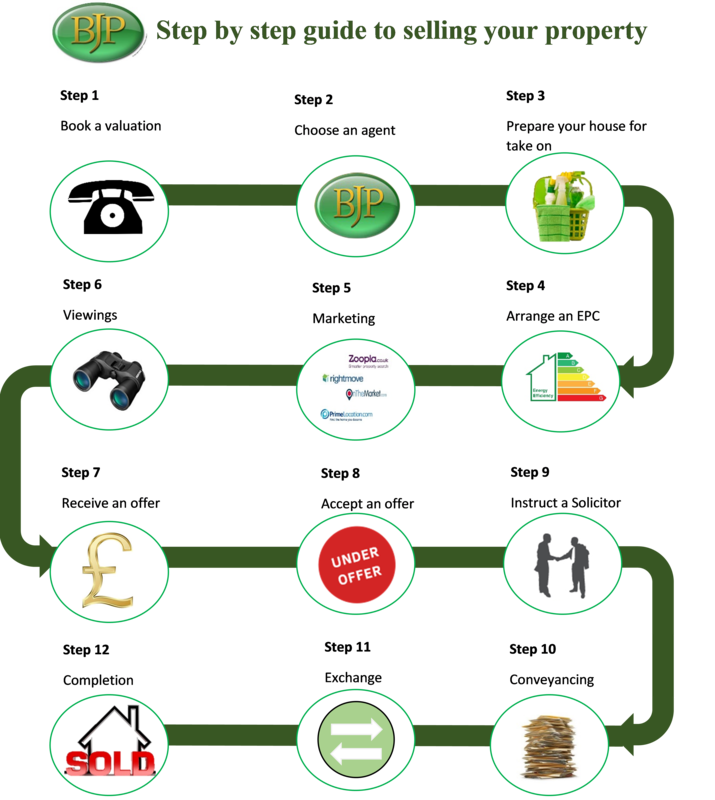 Although you hear of many things going wrong between the offer accepted and exchange, at BJP we will give you constant updates and deal with any potential issues to help insure your property sale goes smoothly. Click here to see a list of local solicitors. Draft contract The seller’s solicitor draws this up from the information contained within the property deeds. This contract will also contain information such as items included in the sale, buyers and seller’s names, the date of transaction and the sum the property is being sold for. The contract has two parts – Conditions of Sale and Particulars of Sale. The conditions will have details about the proposed completion date and any deposit required on exchange of contract. The particulars describe the property and the details of the freehold. Preliminary Enquiry The solicitor acting on behalf of the purchaser will send a list of pre-contract enquiries to the seller’s solicitor. Some basic information will be uncovered at this point with regard to the boundaries of the property, whether the property is connected to the appropriate utilities and what is included in the sale. Property Information Form Sellers solicitor will require information such as fixtures, fittings, boundaries etc to put into the draft contract. Approval of Draft Contract When both parties are happy with the details of the contract, it is sent to the purchaser and seller for signing. Arrange completion date The solicitors will co-ordinate with their respective clients to arrange a suitable completion date – you will then be in a position to exchange contracts. On the day of completion transfer of the ownership of the property will take place, subject to you as the seller receiving the money for your property. Congratulations – You are now Sold.